In honor of her 96th birthday, a favorite story and a few additional thoughts about Sister Lauren Weinandt. In honor of the 96th birthday of one of our favorite people — and Mayo's longest-serving staff member — we wanted to rerun one of our favorite stories of the past year. We could say many nice things about Sister Lauren Weinandt, but Dr. Noseworthy (aka, Mayo Clinic president and CEO John Noseworthy, M.D.) beat us to it (and said it better) in a card he sent to the good Sister on Aug. 2 — her 96th big day. "Today we celebrate your zest for life, bright smile and caring spirit. You truly are a gift to all those who walk the halls of Saint Marys," he wrote. "Thank you for all you do each day to promote the Mayo Clinic values and for your dedication to keeping the history of Saint Marys, ensuring it remains vibrant for future generations. As our longest-serving employee, you exemplify our values in all that you do." Earlier this year, Sister Lauren celebrated another milestone of a sort. And we did get that scoop. Enjoy. The Teletype machine whirred to life the other day at In the Loop world headquarters (a cubicle in a building that backs up to the historic Plummer Building in downtown Rochester). It was clearly the sound of breaking news. "After 45 years of bazaars and sales and 60 years of work at Saint Marys, I came in one day and found my name on the door. I guess they decided to keep me," the message from Sister Lauren Weinandt read. "Stick with your job long enough you get your name on the door." Jokes about her "probationary period" come with an easy chuckle (and maybe a sigh) from Sister Lauren. But she was in fact a bit surprised that after 60 years of service, she arrived at her office one day to find a nameplate bearing her name by the door. Somehow, that had never happened before. To find her in recent years, you'd have to look for the Development Archives Office at the Saint Marys campus of Mayo Clinic Hospital — Rochester. Throughout her tenure as an archivist in said office, Sister Lauren has had many people stop in and ask if she is, in fact, a Sister, and more specifically, if she's Sister Lauren. "I don't know how many times I've answered that question," she says with a laugh. Then one day, it seems Sister Tierney Trueman, who works in Administration at the hospital, finally had enough, saying, "You oughta have your name on the door. Everybody asks where your office is, and it would help if you had your name on the door," Sister Lauren tells us. "I said, 'I've been here for 60 years and nobody's ever said anything about it!'" Soon after that conversation, Sister Lauren was the recipient of her very own Mayo Clinic-issued nameplate. "It feels like I belong here now," she says with another laugh. "I think they're finally going to keep me!" And keep her quite busy, it seems. 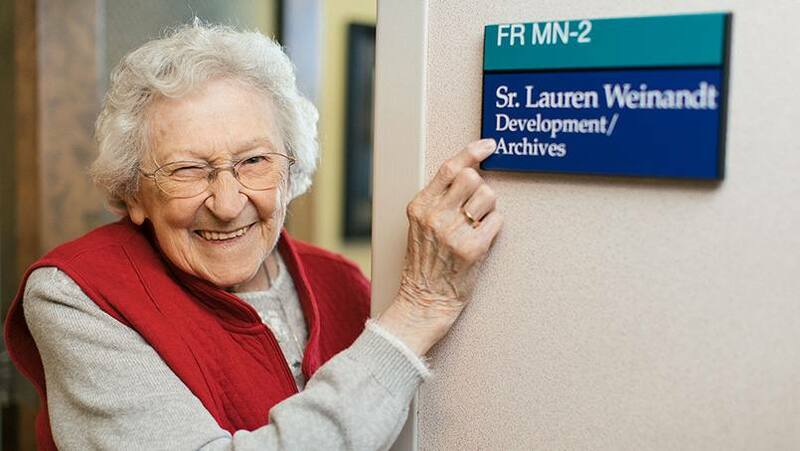 Sister Lauren, who turned 95 last summer, tells us her days in the Development Archives Office "usually" begin promptly at 8 a.m., when she reviews "the events and happenings of the day." She archives any newspaper stories about Mayo Clinic or "big events around the world" in the hospital's Annals book. "We have one for every year dating back from the beginning of the hospital," she says. There also are visitors to tend to throughout the day. Lots of visitors. "I have a lot of people who stop by my office and ask questions, or tell me things like they've been a nurse here or worked here or been a patient or a Sister here, and they'll then ask me if I know, or knew, so and so," Sister Lauren tells us. "I get a lot of questions during the day." And now, thanks to her shiny new nameplate, visitors won't have to wonder if they're in the right place. Make a name for yourself by sharing your comments below before using the handy social media tools atop this page to share this story with others.